For most of the history of the Web, it’s been about pages and links. This simple yet profoundly powerful structure has led to many of the most important capabilities of the Internet including search, analytics, network effects, and other valuable features and outcomes. For their part, enterprise intranets have largely based themselves on this model using the same technologies, eventually going on to craft special standards on top of the Web for their own requirements for things like portals, single sign-on, and so on. Not much changed for many years, until RSS — and therefore workable syndication — arrived in 2003 and hit it big; so big that virtually all Web sites today offer some or all of their content in a syndicated data feed of some kind. Thus the Web was finally transformed into open streams of data that could easily flow to wherever anyone wanted them instead of being “trapped” on the sites it was stored on. This led to open APIs and the Web began to take on its modern form including the now-realized promise of real Web apps, mashups, and powerful Web-connected mobile apps like we see on the iPhone today. Admittedly, some people would point out that the Semantic Web and other initiatives aimed at evolving the Web a priori have been taking place for years. But none of them had the wide success of either the original Web or its subsequent opening up by syndication and APIs. Until now that is. I would argue that presently we are well into the emergence of a 3rd major element of the modern Web, and that is namely the Social Web. Therefore at its core the Social Web is made up of a specific combination of structures and activities designed to track people and the information they want to share with each other on the Web. The primary element everyone is familiar with is the user profile. This consists of a list of verified friends or contacts and is usually opt-in, unlike traditional contact lists or address books. The pure data version of the user profile is sometimes called the social graph. Another important structure of the Social Web is the activity stream. It consists of all the social actions that have taken place within a social graph, which are comprised of things like ongoing conversations, new bits of shared information, successful friend requests, and any other events defined by your social environment. Activity streams are usually organized in reverse chronological order, with the most recent activity on the top. Thus social actions reflect the dynamic actions in social systems and activity streams capture these events in an ongoing narrative that can be read or consumed elsewhere. Needless to say, because activity streams tap directly into the now of your social universe, they have become the centerpiece of attention in most social networks. Most people interact with their activity streams every day in their Facebook news feed, Twitter stream, news reader, or enterprise social network. Activity streams are a valuable online record that contains an archive of the accumulated knowledge of the human (and sometime machine) activity within your social graph. 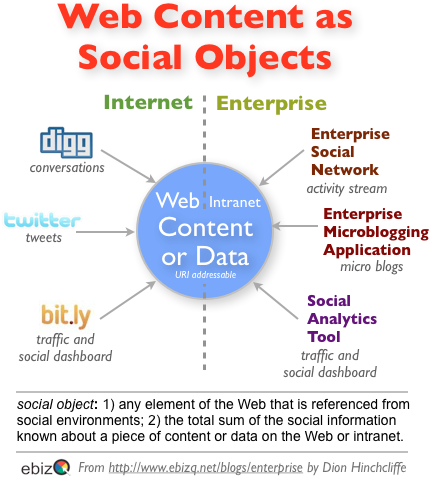 Much of this illuminates or otherwise reflects on other parts of the Web and leads to the concept of social objects.